The iron condor is a favourite among traders because, being a double credit spread, you receive twice the premium but only incurring margin for only one side of the trade. Being a range trading strategy, all you really want is for the underlying to remain within the range until expiration date and you keep it all ... right? One trap that iron condor traders fall into, is that they wait until it's too close to expiration date before exiting the position. By this time, your ability to adjust the trade has been compromised by a combination of theta time decay on your out-of-the-money positions and intrinsic value on the sold options for the side of the trade that is under threat of being breached. Late adjustments will result in a much narrower range if the same profitability is to be maintained. A narrow range with a short time to expiration can be quite precarious. One solution is to close a portion of your postions and secure some profit when the underlying is in the "sweet spot" or optimal position on your risk graph (i.e. the mid-point of the range). This frees up capital to deploy elsewhere, while at the same time, offsetting any potential losses on the portion of the original trade that you didn't close out. 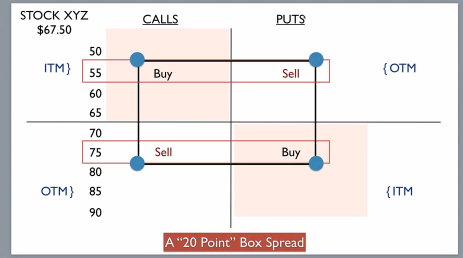 A better solution is to understand that by adjusting your postions just once a couple of weeks into the trade, you not only take some profit out of the market, but at the same time, re-position your "sweet spot" into the middle of the range, allowing you to collect further profits from accelerating option time decay. This is one of the techniques they teach you (among other things) in the Trading Pro System series of videos. The best time to enter your original iron condor trade, is between 40 and 30 days till expiration. Here, you can usually get a nice wide spread and at least 70-90 cents credit per underlying share covered by the options. This is what you want - plenty of room for the underlying to move around in. Your theta (time decay) graph will also have a nice broad curve to it. 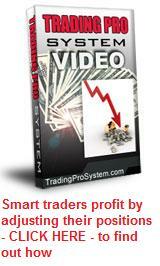 This allows the underlying to move further while still showing a paper profit. Draw your channel trendlines on the underlying first to make an assessment where it might possibly go within the next few weeks and establish your iron condor range around it. It is not advisable to remain in the trade after you've passed the halfway mark in terms of total time to expiration from original entry. Don't be greedy! The halfway mark offers the best time/risk/reward ratio, assuming price and volatility are not on the move. If you're in the "sweet spot" (midpoint) around this time, you can usually collect about 70 percent of your total potential profit. This is a good deal - 50 percent of total time for 70 percent of total profit. Take profits and start over with something else. If you stick around in the hope you'll grab that little bit extra with less than two weeks to expiration, time decay and price volatility can ruin you. Bottom line:- don't ever let your "time in the trade" percentage exceed your "total potential reward remaining" percentage. Seventy percent time in the trade for only another 20 percent potential reward is not a good deal.